The mighty 82 metre motor yacht Sarafsa has been listed for sale at Royale Oceanic. Built in steel and aluminium by UK yard Devonport Yachts, she was delivered in 2008 with a beam of 15 metres and a Gross Tonnage of 3179. The yacht’s build was managed by Royale Oceanic with naval architecture and technical supervision overseen by Burness Corlett and Three Quays Marine. Exterior and interior design of this yacht for sale is by Winch Design and features a large spacious interior befitting a yacht of this length. Accommodation is spread over six decks and comfortably sleeps 12 guests in six well appointed double guest cabins, all with en suite bathrooms. The attention to detail throughout is of a high standard with features such as a glass topped atrium covering the main spiral staircase ascending through all six decks, a comfortable cinema and a winter garden dining area which can be open or enclosed by glass sliding doors. A fully equipped spa with swimming pool is located forward of the helipad and has a retractable roof. The garage is large enough to accommodate several toys including six jet skis and a small car while two luxury Diva Royal guest tenders are located onboard along with two further tenders. Twin 2,000hp MTU diesel engines give her a range of 6,000 nautical miles at her cruising speed of 13 knots and she is fitted with at anchor stabilisers. 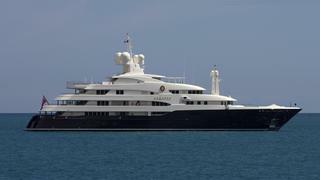 Built to Lloyds Class and LY2 Large Yacht Code, she can operate to commercial requirements under a Cayman Islands Flag. Running with a crew of 20 and with accommodation for 10 personal staff, she has much to offer a potential buyer. Sarafsa is offered for sale with her price available on application.